Sardinia is the second-largest island in the Mediterranean Sea (after Sicily). The area of Sardinia is 24 090 square kilometers. The island lies surrounded (clockwise from north) by the French island of Corsica, the Italian Peninsula, Tunisia and the Spanish Balearic Islands. Sardinia is a constitutive part of Italy, with a special statute of autonomous region under the Italian Constitution. 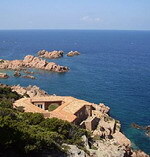 The island contains numerous extraordinary tourist areas, including the Costa Smeralda and Gennargentu. The island is particularly famous for its beaches, but is also rich in other interesting places, such as some charming sea towns and archaeological ruins. The Nuraghi Apartment is located in the charming island of Sardinia (Italy), the second largest island in the Mediterranean Sea and a natural reserve, plenty of calm beaches and a slightly mountainous countryside full of towns with enchantment, prehistoric ruins, Roman and Carthaginian rests, romanic churches and gothic temples and quarters. The island is perfectly communicated with many countries of Europe thanks to its 4 airports and its ferry connections with Italy and France. We may provide detailed information on air and sea connections. 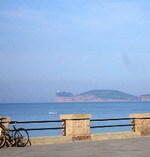 The apartment is completely furnished and it is spacious (77 m2) and very bright. It has a large entrance, an open-plan kitchen with table and chairs and completely equipped, a livingroom, a bathroom and a bedroom with double bed. The apartment has at your disposal two air-conditioning machines either for summer or winter, washing-drier machine, TV and butane gas cooker. Sleeps 6. A fantastic 4 bedroom villa with 3 bathroom, dining room, sitting room, patio with barbeque area, great sea view and and a sun terrace. Thiss villa has 3 double bedrooms and another double room with 2 single beds, 3 new bathrooms, dining area, kitchen and sitting room, outside patio and garden with sea view, plus a wonderful roof terrace to enjoy the hot sunshine. It is a fantastic house for relaxing, the beach is only 12 minutes walk, shops, restaurants and bars are only 5 minutes walk. Sleeps 8. A two bedroom apartment, with a breathtaking sea view and a wonderful terrace where you can sit and relax. Brezza Marina apartment is close to the beach, within a walking distance to the Sabbie Doro bay, it is located in a private area with residents access only,all accommodations there, have been built in two floor levels and a choice of 1, 2 bedrooms flats with cooking facilities are available, the view of the sandy dunes, the ocean and the wild natural beauty will take your breath away,also are surrounded by Mediterranean vegetation, rocky cliffs, water bays and little beaches. Our accommodation is provided with all the equipment you may need for your home cooking, have an outside area for your al fresco time, well furnished, comfortable and well decorated. Within 10 minutes walk you can reach: supermarkets, shops, bars, pharmacy and restaurants. Sleeps 4. 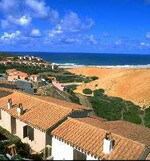 Villa in magnificent position, on the sea-side, private wharf and little bay. 3 bedrooms, 2 bathrooms, American kitchen, dining-room and patio in front of the sea. Villa's view on the private beach and on the bay from the Patio and terrace. You will always eat beside the patio in front of the sea-side. The typical Sardinian style twin bedroom with view on the seaside. A look on the open kitchen. While cooking you see the seaside! The villa comprises 3 bedrooms in total; 1 double, 1 twin, 1 single and 1 cots, 1 of the bedrooms with en-suite facilities. This gives room for up to 6 people. Bed linen and towels are provided for your use. Sleeps 6. The villa is setting on the hill in this natural spectacular scenario of this magnificent part of Sardinia well know as Costa Paradiso The villetta as a beautiful sea view. The villa consist of a large lounge with TV and with double sofa bed and dining area,with venetian windows leading to the garden, patio and the shared swimming pool, with spectacular views out to sea. Kitchen area with doors leading to back patio with built in barbeque, outside sink and shower for after beach. The master double bedroom has venetian windows leading to the patio and bathroom with all commodities. The second bedroom has venetian windows leading to the veranda and garden and the pool. The second bedroom can be with a double bed or spilt into two single beds. There is also two verandas with the spectacular view to the sea and a table and chairs to eating "al fresco" and also a private parking space. Sleeps 6.